Natural disasters don't matter for the reasons we think they do. They generally don't kill a huge number of people. Most years more people kill themselves than are killed by Nature's tantrums. And using standard measures like Gross Domestic Product (GDP) it is difficult to show that disasters significantly interrupt the economy. It's what happens after the disasters that really matters-when the media has lost interest and the last volunteer has handed out a final blanket, and people are left to repair their lives. What happens is a stark expression of how unjustly unequal our world has become. The elite make out well-whether they belong to an open market capitalist democracy or a closed authoritarian socialist state. In Myanmar-a country ruled by a xenophobic military junta-the generals and their cronies declared areas where rice farms were destroyed by Cyclone Nargis as blighted and simply took the land. In New Orleans the city was re-shaped and gentrified post Katrina, making it almost impossible for many of its poorest, mostly black citizens to return. 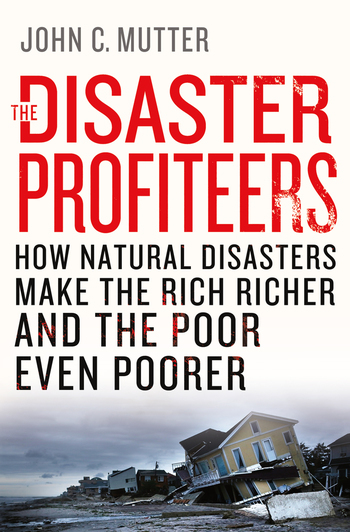 In The Disaster Profiteers, John Mutter argues that when no one is looking, disasters become a means by which the elite prosper at the expense of the poor. As the specter of increasingly frequent and destructive natural disasters looms in our future, this book will ignite an essential conversation about what we can do now to create a safer, more just world for us all. JOHN C. MUTTER is a professor at Columbia University with appointments in the department of Earth and Environmental Sciences and in International and Public Affairs. He was previously deputy director of the Earth Institute. Mutter was a Fellow of the American Association for the Advancement of Science in 2007. A contributor to the blog site OECD and to EARTH Magazine, Mutter has appeared on broadcast media including CNN and CBS. He lives in New York City.